I've been privileged enough to have been able to work as an author on some System Center related books and below you can find details about them. Microsoft System Center Service Manager (SCSM) offers enterprises a complete, integrated platform for automating and adapting IT Service Management best practices to your organization's requirements. 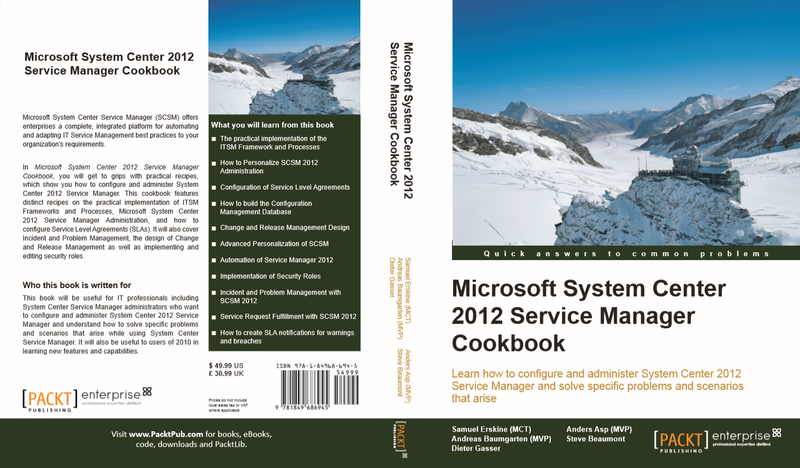 "Microsoft System Center Service Manager Cookbook" provides you with real-world, immediately usable recipes which will show you how to configure and administer System Center Service Manager 2012 and understand how to solve particular problems and scenarios to take this tool further. 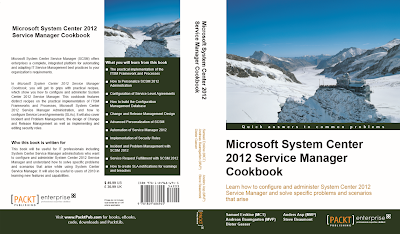 In Microsoft System Center Service Manager Cookbook, you will get to grips with practical recipes which will show you how to configure and administer System Center Service Manager 2012. 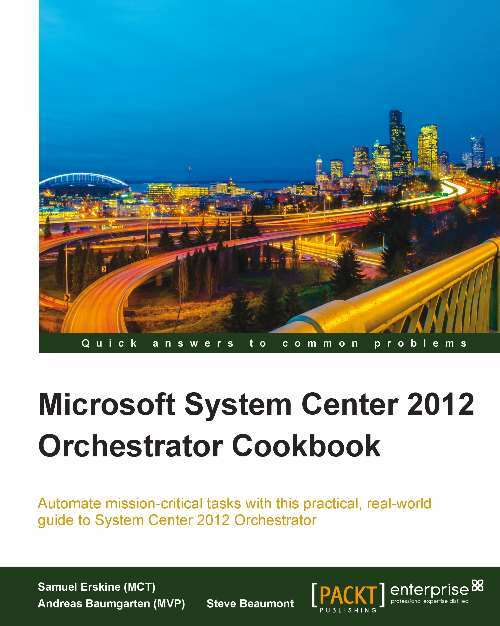 This cookbook features distinct recipes on the practical implementation of ITSM Frameworks and Processes, Microsoft System Center Service Manager 2012 Administration, how to configure Service Level Agreements (SLAs). It will also cover incident and problem management, the design of change and release management as well as implementing and editing security roles. This book is written in practical cookbook style with plenty of vivid, practical recipes to help you master Microsoft System Center Service Manager 2012. Each chapter contains step-by-step instructions about everything necessary to execute a particular task. The book is designed so that you can read it from start to end for beginners; or just open up any chapter and start following the recipes as a reference for advanced users. As organizations become more and more dependent upon a powerful IT infrastructure, there is increased pressure on administrators to be able to monitor and troubleshoot quickly and effectively. 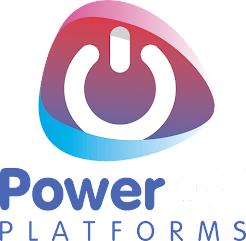 Systems Center Operations Manager makes this possible, giving administrators a simple way to manage the performance of their infrastructure and allowing them to focus on steps to optimize and improve it. Beginning with an introduction to the architecture of SCOM, you will then learn how to integrate and align it with the needs of your business. The book then covers how to configure System Center R2 Operations Manager, deploy monitoring agents, and use the admin console. You will learn about best practices for overrides and tuning, tips for effective maintenance, and learn to monitor applications across a wide-range of platforms within the environment, creating advanced customizations. You will finish by integrating Operations Manager with other R2 components and discovering the powerful data you can collect using this vital tool. 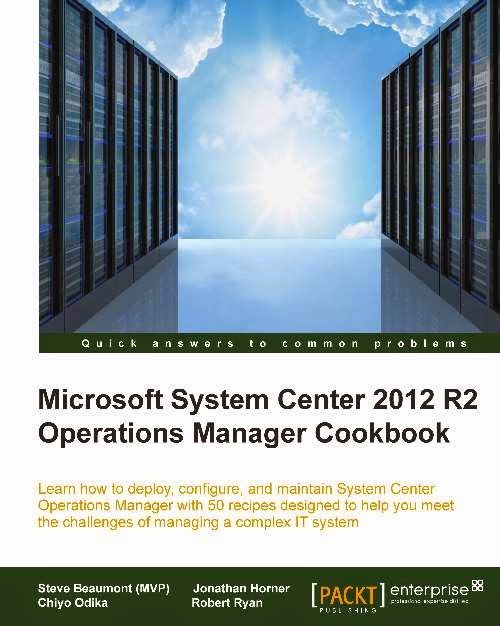 If you are tasked with monitoring the IT infrastructure within your organization, this book demonstrates how System Center 2012 R2 Operations Manager offers a radical and exciting solution to modern administration.